The Brevera® breast biopsy system with CorLumina® imaging technology is a real-time breast biopsy and verification system that streamlines the biopsy process from start to finish. The sys­tem combines tissue acquisition, real-time imaging, sample ver­ification and advanced post-biopsy handling in a single system. Designed for 2D and 3D™ breast biopsy, the system radiologists are able to obtain and image tissue samples in the procedure room in just a few seconds, potentially sav­ing up to 10 minutes per patient and cutting the procedure time by up to 25 percent. 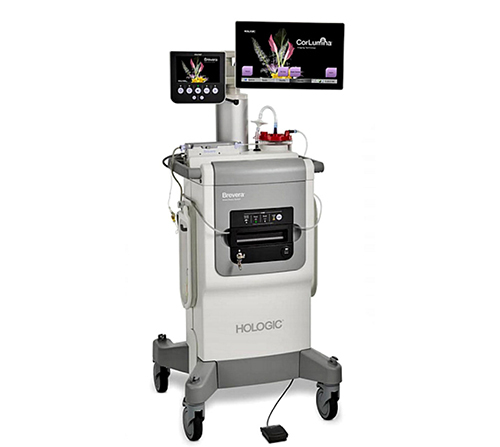 The Brevera sys­tem is designed for use with Holog­ic’s Affirm® prone biopsy system, Affirm breast biopsy guidance system, and MultiCare® Platinum system, as well as most upright and prone systems on the market.